This is the NYC.gov News You Requested For: "CITY HALL LIBRARY NOTES"
March 17 is St. Patrick's Day, a celebration of all things Irish. In honor of St. Patrick's Day and Irish-American heritage, this article focuses on two prominent Irish-American New Yorkers, William O'Dwyer and Paul O'Dwyer. William O'Dwyer was born on 7 July 1890, in Bohola, County Mayo, Ireland, and studied at St. Nathys College, Ballaghaderren. He arrived in New York in 1910, working as a laborer and a police officer while studying nights for his law degree at Fordham University. He built a successful law practice, and served as a judge where he became known for a natural shrewdness and extensive knowledge of the law. In 1939 he won the election for Kings County (Brooklyn) District Attorney and dedicated himself to fighting organized crime. His prosecution of the notorious crime syndicate known as Murder, Inc. brought national attention. He won dozens of convictions and solved 56 homicides. 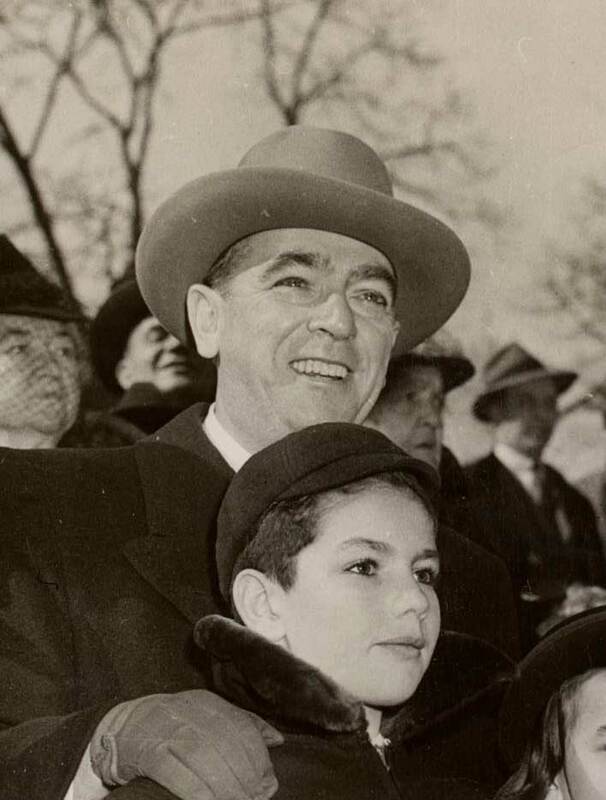 In 1941, O'Dwyer ran for Mayor, and after losing the election to Fiorello LaGuardia, he enlisted in the United States Army, achieving the rank of Brigadier General. O'Dwyer easily won the mayoralty in 1945. At his inauguration he celebrated to the song, "It's a Great Day for the Irish," and addressed the 700 well-wishers gathered in Council Chambers at City Hall with a memorable speech: "It is our high purpose to devote our whole time, our whole energy to do good work..." Re-elected in 1949, he directed resources into post-war infrastructure reconstruction, and presided over the city's first billion-dollar budget. He established the Office of City Construction Coordinator, with Robert Moses at the helm, and created a traffic department. He gave the City's transit system a long-overdue boost, raising the subway fare from five cents to ten cents, and helped bring the United Nations to New York City. In 1948, O'Dwyer received the Hundred Year Association of New York's Gold Medal Award "in recognition of outstanding contributions to the City of New York." President Harry Truman appointed him as Ambassador to Mexico in 1950. William O'Dwyer was married twice. His first wife, Catherine Lenihan O'Dwyer, whom he married in 1916, passed away in 1946. Sloane Simpson, a former model and fashion stylist became the second Mrs. O'Dwyer in 1950; they divorced in 1953. William O'Dwyer returned to New York from Mexico in 1960. He would often attend St. Patrick's Day parades and was always greeted with respect and affection by those who recognized him; often people would call out "Hi, Bill O." He died in 1964, and was buried in Arlington National Cemetery. Paul O'Dwyer, the youngest of eleven, was born 29 June 1907, in Bohola, County Mayo, Ireland. Following in the footsteps of his siblings, he emigrated to America in 1925, and earned a law degree in 1929 from St. John's Law School in Brooklyn. He founded the firm O'Dwyer and Bernstien and gained a reputation for successfully representing controversial defendants such as accused Communists, draft dodgers, and Jewish Americans prosecuted for helping to smuggle arms to Jewish fighters for the Zionist cause prior to the establishment of Israel. Paul O'Dwyer had a life-long commitment to Civil Rights and progressive causes. One of his most significant victories came about in 1951 when he ended discrimination against African-Americans who wanted to move into the Stuyvesant Town apartment complex in Manhattan. He volunteered his services to defend Civil Rights activists in the Deep South, and served as a delegate to the 1964 Democratic Convention where he fought for representation of the black Freedom Democratic Party from the State of Mississippi. He won the right for Puerto Ricans living in the mainland United States to take their voter literacy tests in Spanish, and assisted in the defense of the Harrisburg Eight who had been accused of plotting against the Nixon administration during the Vietnam War. He represented labor unions including sandhogs, longshoremen, and others fighting to improve working conditions. He was a life-long card-carrying member of Local 975 of the International Longshoremen's Association. After a few close elections, he won the race for President of the City Council in 1974. He held the office until 1977. He presided over a successful effort to change the official founding date for the City of New York from 1664, the year the Dutch surrendered the Colony to the British, to 1625, the year the Dutch originally founded the colony. In 1990, Paul O'Dwyer became the chief liaison between the city and the international diplomatic community when Mayor David Dinkins appointed him as Commissioner for the United Nations and Consular Corps. In 1994, he led the American welcome for Gerry Adams, the republican political leader from Northern Ireland, and served as coordinator for the American League for an Undivided Ireland. 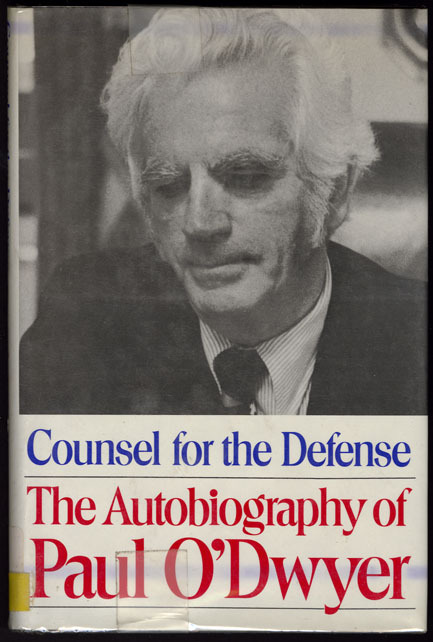 His autobiography, Counsel for the Defense, vividly describes his long career in support of progressive causes. Paul O'Dwyer passed away in 1998, at age 91. His first wife of 45 years, Kathleen Rohan O'Dwyer had died in 1980. In 1984, he married Patricia Hanrahan, a former aide to Governor Mario Cuomo. She survived him along with four children from his first marriage, eight grandchildren, and three great-grandchildren. Brian O'Dwyer succeeded his father Paul as head of O'Dwyer and Bernstien. The firm specializes in cases involving labor relations, employee benefits, personal injury and general litigation. Brian O'Dwyer serves as counsel to the benefit funds of the International Brotherhood of Teamsters, United Service Workers Union Local 74, and other benefit funds. 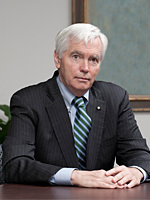 In 2009, Irish America Magazine recognized him as one the Top 100 Irish-American Lawyers in the United States. Secretary of State Hillary Clinton appointed him as Commissioner of the United States National Commission for UNESCO in 2011. Consult the Library catalog and the biographical and clippings files for further resources on Irish-American heritage and history. For more info on the City Hall Library, please visit our website.